"Driver monitoring systems (DMS) is largely needed by commercial vehicle ADAS and will be a standard configuration for future L3 passenger cars. Half of vision-based ADAS companies are developing DMS, including EyeSight, Shenzhen Autocruis Technology Co., Ltd., Roadefend Vision Technology (Shanghai) Co., Ltd., Whetron Electronics Co., Ltd., Wuhan JIMU Intelligent Technology Co., Ltd., Minieye, Beijing Smarter Eye Technology Co., Ltd. and Black Sesame Technologies. In 2018 Israel-based Foresight unveiled its QuadSight quad-camera vision system. Using four-camera technology that combines two pairs of stereoscopic infrared and visible-light cameras, the system is designed to achieve near 100% obstacle detection with near zero false alerts in any weather or light conditions (including complete darkness, rain, haze, fog and glare). Magna and Renesas collaborate in fusion of Magna’s eyeris 3D surround-view camera system with the latter’s SoC (system-on-a-chip) to develop a more cost-effective 3D surround-view system especially for entry-level and mid-range cars. In 2018, the OEM installations of cameras (inclusive of front view, rear view, side view, interior view, surround view, driving recorder camera, among others.) 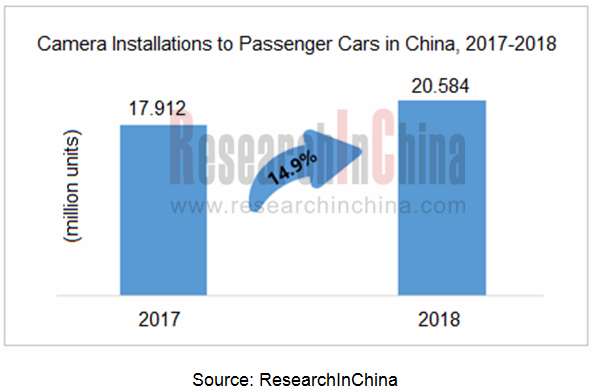 to passenger car reached 20.584 million units with a year-on-year surge of 14.9%, of which front camera soared 28% YoY, surround-view camera shot up by 30.1% YoY, and stereo camera skyrocketed 170.3% YoY."